Yesterday was the ninth anniversary of the day I met J. Last weekend, as a kind of celebration but mostly just because I really wanted to, we went on a brief road trip around southwestern South Dakota; we saw Mount Rushmore (so surreal; why did we do this? ), Badlands (completely sublime!) and Crazy Horse (depressing af; seeing the plans for what it's supposed to look like feels like looking at paintings of cities on Mars from the 1950s). I have wanted to visit South Dakota for years. Two thumbs up! Recently, I have noticed an overabundance of uncertainty in literature – across genres, but especially in essays. The tricks we use to appear uncertain – asking questions instead of making definitive, declarative statements, for example – have become tics. Overuse these tricks and the piece assumes a pose of ignorant wonder – What is such & such abstract concept? Who can say? How can we ever know? The British technology journalist Ian Betteridge is credited with the adage “Any headline that ends in a question mark can be answered by the wordno.” I want to make a similar claim: Any question at the end of an essay can be answered with the word yes. (Same goes, most likely, for poems, short stories, etc.) The question is a kind of weasel syntax that lets the author have it both ways: make a gesture toward profundity without having to commit to it. The second approach is driven by urgency: Find the thing you want to write so much you don’t even have to schedule time for it. I have another friend, a novelist, who said he solved the problem of “writer’s block” by abandoning the high-minded projects he felt he should be working on and started writing the novel he desperately wanted to write. Suddenly he couldn’t wait to get home from his job to work on his novel. Previously, he had had to schedule time for writing and it still felt like a slog. I take a similar approach to reading—I surround myself with books (mostly from the library) and abandon them freely. If I force myself to finish a book just because I’ve started it, I’ll find something to do other than reading, but if I only read what I really want to read, when I want to read it, I’ll make time for reading almost every day. I am in need of new questions for my column, so if you have any questions about writing, please send them to blunt@electricliterature.com! Nothing Natural by Jenny Diski - Interesting feminist novel about a woman who sort of falls into an affair with a masochist. Constructed almost perfectly like a movie, I realized toward the end, and might even make a better movie than a book, in that Diski tends to let her protagonist think too much (or rather she shows us her thinking too much); it would be nice to just SEE/imagine this thinking. Jane Campion should do it. Has a fascinating ending. Women by Chloe Caldwell - Read it on a plane to Seattle. I believe this is what Emily Keeler calls "reality fiction." Made me realize the novella is almost uniquely suited to the story of a love affair. Among the Ten Thousand Things by Julia Pierpont - Extremely readable family/"domestic" novel. In the vein of Nicole Krauss. 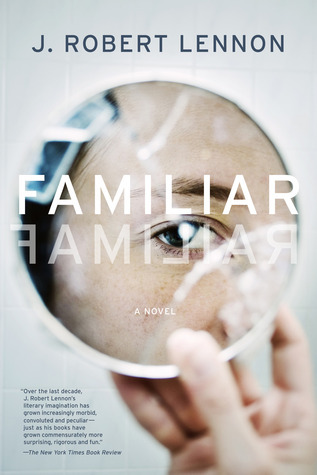 Familiar by J. Robert Lennon - Fascinating, creepy conceit: The protagonist (whose name is Elisa!!!) has either suddenly switched to a parallel universe where her son isn't dead, or she's had a psychopathic break. Like A Pale View of Hills, it's irresolvably ambiguous. One of my favorites so far this year. I Am Sorry to Think I Have Raised a Timid Son by Kent Russell - Essays. A total dude book, but I liked it anyway, very much in fact. He alternates journalistic pieces on Weird Subcultures (Juggalos, Amish baseball players) and Singular Freaks (a guy who self-"vaccinates" himself against venomous snakes) with a long essay in parts about his dad and their relationship. More and more affecting as you go. He has a knack for a descriptive image, like when he describes a snake's body and head as it leaps to bite like a rope trailing after a harpoon. Unmastered by Katherine Angel - A loose, or perhaps open, diaristic kind of long essay on the subject Nothing Natural tackles in fiction: the (supposed?) conflicts between desire and feminism. The Kiss by Kathryn Harrison - Famously disturbing memoir about a writer's affair with her father in her early 20s; not as disturbing as I expected TBH, in that it's not depicted as a true "affair" (she's more under the spell of a manipulative narcissist). Between Me and the World by Ta-Nehisi Coates - This is either a short book (~150 pages) or one long essay about what it means to be a black man (or, to a much lesser extent, a black woman) in America, framed as a letter to his son. You learn early on in the book that it was written (not just published) this year, and at first it seems kind of rambly and hastily edited, but about 50 pages in it starts to feel much more focused and therefore more powerful. Lots to think about, like the toll on the body that a culture of fear takes; "the body" is the main theme here. Coates is an atheist, so he takes no comfort in an afterlife for the soul. The soul IS the body he says, and once you destroy someone's body he is gone. I'm glad I read it. Earlier this summer I was starting to feel like I was in a cooking rut and making the same things all the time (i.e. MOSTLY TACOS), so I've been trying to shake it up. I remembered this recipe for kimchi relish, which I make in the food processor and use like salsa (I add cilantro). It's freaking delicious, great on eggs or any kind of meat. J had some lousy chicken piccata in Rapid City (NOT a food town), so I made a better version this week. I have also been making a curried lentil soup using split red lentils (which cook super fast) and coconut milk. Oh, and I made enchilada sauce with fresh green chiles and then used it for stacked (New Mexico style) enchiladas with shredded chicken and kale as the filling, no cheese (J is off dairy) and was surprised to find that I really didn't miss the cheese. I haven't made it in a couple of weeks, but my "house cocktail" this summer was tequila, lime juice, simple syrup and a few slices of jalapeno, shaken. You can add other citrus (grapefruit, orange, etc) and cilantro if desired. MMM.